When Sarah Lavely gets angry, she likes to break things. Not all the time, but on days when everything seems to be going wrong, she has been known to throw some plates against a wall. Fortunately, she has an easy outlet: Lavely is the founder of Sarah's Smash Shack, a San Diego shop where customers pay to smash tableware like dinner plates, wine glasses, intricately lined sashimi plates, brightly colored vases and goblets. The store's pristine white shelves are filled with china just waiting to be broken. "I picked pretty things because people are coming in here to do something they aren't supposed to do," Lavely says. "And breaking stuff like this is a little taboo." The smashing is done in special soundproofed "break rooms" where customers - outfitted in coveralls, boots, gloves and a helmet - stand behind a chest-high barrier and hurl breakables at a stainless steel-covered wall. All the broken glass is donated to schools and art programs throughout the region. Lavely, 38, is a former veterinarian. She began venting her frustrations on breakables as a child - she started with Christmas ornaments, then escalated to potted plants. As an angst-ridden teenager she targeted telephones and, once, a window. "During my divorce," she says, "I broke a lot of stuff on my driveway." 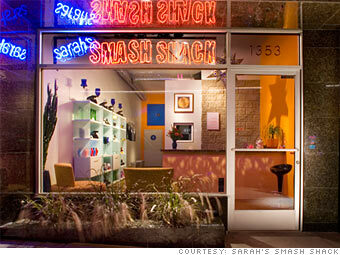 That was when the idea for the Smash Shack came to her. Lavely hit an emotional rock bottom and woke up one day thinking: I really want to go break some stuff. "I wished there was someplace I could go and just do that, just go nuts," she says. "I was sure other people felt like that at times, and I thought I should open a shop where you could do that." Last November Lavely approached her friend Ed King, 34, a former veterinary technician, about partnering with her to start the business. After start-up costs of around $200,000, the store opened August 1. As pioneers in the smash-for-cash business, Lavely and King have had to start completely from scratch. Greek restaurants aside, there are few if any places like Lavely's in the U.S.
"We had no business model to follow, no precedent, no place where you come only to smash things," she says. "We had to figure out what we needed - a room big enough to contain broken glass - how far is a safe distance from the smash wall, and what kind of safety equipment we would need." In February, Lavely signed a lease for a two-story building in San Diego's trendy Gaslamp district. With the help of her husband Teague Hunziker, 35, a professional photographer and graphic designer, she and King sound-and-safety-proofed the break rooms, researched how different kinds of glass break, and installed sheets of heavy gauge stainless steel on the smash walls. The rooms are also equipped with sound systems that allow customers to hook up their iPod or MP3 player. Ceramic white dinner plates are Lavely's biggest seller, because they require a strong toss and break violently against the wall. Patrons order from a menu that includes items like The House Special (15 plates in 15 minutes for $45), the Six Shooter (six rapid-fire wine glasses for $12) or the Juggernaut (two large jugs for $12.) Value seekers can opt for the Mystery Box: 10 assorted smashables for $25. If you'd like to smash a person, Lavely allows the next best thing - a photo inserted into a very breakable glass frame. Since the shop opened business has been steadily increasing, with each night, on average, busier than the last. Despite consumers' tendency to be budget conscious in a down economy, Lavely is getting calls from groups of people who want to come to her shop from as far away as Los Angeles. Economic uncertainty might actually be driving business, as customers smash their way through the frustrations of high gas prices, a slumping housing market and rising unemployment. "We leave Sharpies in the break rooms and people will write on a plate before they throw it. I don't read what they write, but when those customers are finished you can see they feel pretty emotional," Lavely says. "But that's why they came, to throw their frustrations against a wall and walk out the door feeling good." On a recent Wednesday night, four middle-aged women came in to celebrate several birthdays at once. As they filed into the largest break room, where several piles of white plates sat waiting to be destroyed, they were giggly and nervous. But once the music started, the women began throwing plates - on which they had scribbled angry notes about home lives, work frustrations and teenage children - like Frisbees. They screeched with delight at each satisfying crack and splatter. When they emerged from the room, breathless and exhilarated, participant Beth Daugh said, "That was intense, really cathartic." She took off her helmet and shook out her hair, her face red and damp. "Writing message on the plates was the best part. Great therapy."